(Phys.org) —Where there's wildfire, there's smoke—a lot of it. And those vast, carbon-laden clouds released by burning biomass can play a significant role in climate change. 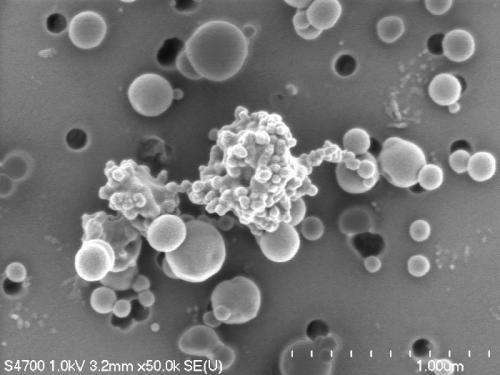 However, not much is known about the different types of particles in wildfire smoke and how they affect climate. Now two Michigan Technological University researchers have uncovered some of their secrets. In particular, they studied an important component of smoke that has so far been absent from most models of climate change. A team including Claudio Mazzoleni, an associate professor of physics, PhD student Swarup China and Michigan Tech physics alumnus Kyle Gorkowski of the Los Alamos National Laboratory, along with other LANL scientists, looked at two types of particles captured during the 2011 Las Conchas fire in New Mexico: soot, not unlike that found in diesel exhaust; and tar balls, tiny round blobs that are abundant in biomass smoke and composed largely of carbon and oxygen. Tar balls made up 80 percent of the particles from the Las Conchas fire, but they have not yet been integrated into most climate-change models. 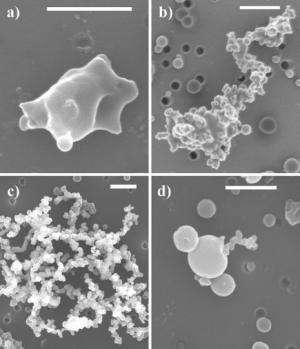 China and Mazzoleni observed the soot and tar balls using a field emission scanning electron microscope at low voltage, which enhanced the contrast between the different particles. Tar balls, they discovered, come in two main types in the electron microscope images: "dark" and "bright." The dark tar balls are more oxidized, and the two types likely absorb and scatter light differently. Soot particles are even more diverse. China and Mazzoleni identified four categories of soot, from bare to heavily coated, each with different optical properties. The team also heated tar balls and soot in a special chamber, which baked off their coatings and provided additional insights into their composition and properties. Determining what effects these particles have on climate goes beyond understanding how much heat they might retain. For example, water vapor condenses more readily on oxidized particles, so they can play a role in cloud formation. So, do tar balls warm or cool the Earth? "We don't have an answer to that," Mazzoleni said. "The particles might be warming in and of themselves, but if they don't let solar radiation come down through the atmosphere, they could cool the surface. They may have strong effects, but at this point, it's not wise to say what. However, our study does provide modelers new insights on the smoke particle properties, and accounting for these properties in models might provide an answer to that question." "The big thing we learned is that we should not forget about tar balls in climate models," China said, "especially since those models are predicting more and more wildfires."